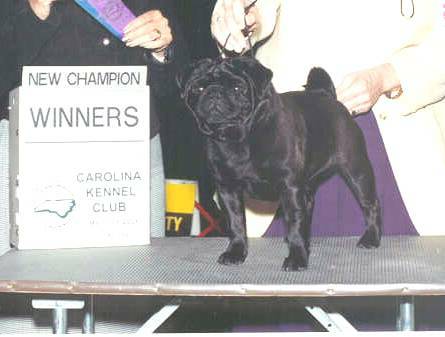 Casper was bred by Debbie and Ronnie Doan of ShorLine Pugs. He is a delightful little guy and produces absolutely lovely puppies. He is very very short and cobby with a huge head and tons of bone and you will see this in his puppies. He also has a charming temperament. He carries a fawn gene and therefore throws both fawns and blacks. Sadly Casper passed peacefully over the rainbow bridge May 4th, 2011. We will greatly miss him but will see him again. Thanks for all the wonderful years of happiness and love you gave us. He gave us 25 lovely champions.